Leo James Ireland was born September 3, 1926 near Asquith Saskatchewan. He was predeceased by his wife Carrie (nee Bill) and also by his wife Rose Closson, he lost his son Donald James and his youngest daughter Wendy Louise (Gordon Candlish). Leo was also predeceased by his brothers Clifford and Joe, sisters Saraha, Louise, Verna, Gertie, Margaret and May, as well as many nieces and nephews. He is survived by his youngest brother Gordon Robert (Monica). Leo and Carrie lived in Quesnel for a number of years with their children. Leo loved his family very much. 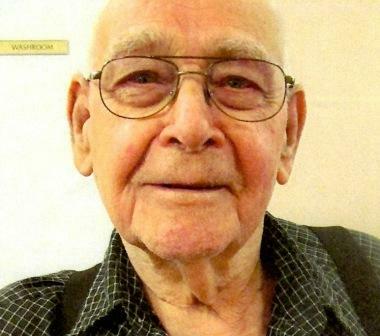 He has 19 grandchildren, 27 great grandchildren and 4 great – great grandchildren. Leo lived in Barriere before the fire in 2003. Leo and Rose did travel and do a lot of camping. Leo was truly respected and had many, many friends and he enjoyed having coffee at various cafes around Barriere. Leo loved his scooter and put many miles on it. The people of Barriere knew him as the man who was always on the go and always had a hello to all. Leo will be greatly missed but he is always in our memories. Service for Leo James Ireland will take place on Saturday, April 29, 2017 at 1:00p.m., at the Barriere Seniors Hall, 4433 Barriere Town Road, Barriere, BC. Funeral Arrangements are entrusted to Drake Cremation and Funeral Services, Barriere, BC. Condolences to the family may be sent to Drake Cremation.com. So sorry to hear of Leo’s passing, he will be forever loved, & missed, RIP my dear friend.